I love different cuisine and the food at Tokyo Disneyland Resort offers a great variety! There is something for every pallet to be sure. Whether you like burgers and dogs to some way out funky stuff, you’ll find a great selection at the Tokyo parks. I’m going to focus on some of my favorites, some things I found interesting that you may want to know about, and just some good eating in general. So let’s dig in! Sponsored by House Curry, this place only serves curry but if you like it, it’s a great place to go. This was the large size special. It wasn’t huge considering half of the plate was just the curry sauce, but it was filling nonetheless. And darn good. If you like curry, be sure to make your way over to the Hungry Bear Restaurant in Frontierland at Tokyo Disneyland. They have a wide selection of curry options but the “house” specialty is the Scrambled Egg and Fried Chicken Curry. I had to try it and see what it was all about. The curry itself is pretty mild, even the regular version so don’t expect it to be super spicy. And if you like American size portions – order the large. For an American appetite it might still seem pretty normal. It tasted great. They also have both fried pork cutlet (tonkatsu) curry and beef curry as well. If you’re over at DisneySea and craving some curry head over to the Casbah Food Court at the Arabian Coast. Similar menus but slightly different presentations (and no Scrambled Egg and Fried Chicken Curry at DisneySea). Quite the spread for a good lunch at Restaurant Hokusai. If curry isn’t your thing, maybe some traditional Japanese food is your jam. Believe it or not it’s kind of hard to find traditional Japanese food in the parks. Two sit-down restaurants in particular feature this kind of cuisine – Restaurant Hokusai in Tokyo Disneyland and Restaurant Sakura in Tokyo DisneySea. I would definitely recommend getting reservations in advance. Hokusai was delicious. Again portions are small, but the meal as a whole will fill you up and the changing flavors on your palette certainly keep your taste buds engaged and happy. 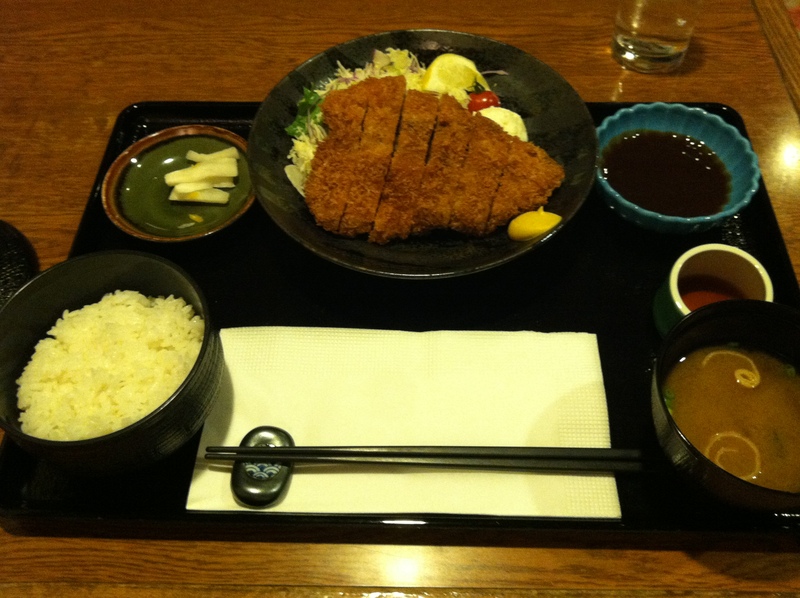 I happened to get the pork cutlet which is breaded in panko crumbs and then deep-fried (tonkatsu). The quality was just top notch, too. Perfect rice, perfect miso soup, and the pork cutlet was delicious. Even though this is table service, they don’t pick up your check so just pay on your way out. I didn’t get the chance to go to Restaurant Sakura as there were so many different options I wanted to try, but the food is similar and I’m sure you can’t go wrong. Crepes are a big deal in Japan. Just as Americans love burritos, tacos, and tortilla wraps, the Japanese love crepes. At Cafe Orleans in Tokyo Disneyland they had an interesting variety to choose from – Kheema Curry and Potato Salad Crepe, Chicken Salad Crepe, and Cajun Shrimp Salad Crepe along with a basic Strawberry Crepe and Banana and Chocolate Crepe. Perhaps my favorite place to eat was in Tokyo DisneySea at Vulcania located in the Mysterious Island. They had such a great mix of different Asian dishes that I just had to try a little of everything. Dim sum, mabodofu (pork and tofu in curry sauce), fried rice – it was all delicious. I just wish I had more! Served counter service style you go down the line and pick and choose what you want to eat. It’s all good. But if you’re in the mood for a mix of food, head over to Sailing Day Buffet in the American Waterfront for a huge selection. It’s not the best food you can get, but there is always something to satisfy your palette. Another great choice is the S.S. Columbia. Literally located on a ship in DisneySea (that looks like the Queen Mary), this place is another sit-down gem. We celebrated my wife’s birthday there and the staff was so attentive and the food was fancy for park fare. The desserts were tasty, too. So many different places to eat and I’ve only named a few. Which have you enjoyed at Tokyo Disneyland? Which ones are you dying to go to? Let me know if you go! I’d love to hear about more wonderful treats to eat! For more about the attractions at Tokyo Disney Sea or Tokyo Disneyland click on the links. To read about snacks at the Tokyo Disneyland Resort click on this link. To read about the Tokyo Disneyland Hotel click here. Want to learn about the basics of Tokyo Disneyland Resort? For more information about parades, Fantasmic, and the culture click here! just wondering – do any of the people at restaurants/quick service places speak english? That’s a great question! There are some who speak English, but generally they don’t. Since ALL the menus are in English and they have pictures for just about everything, it really won’t be hard finding things you are familiar with. Now if you have allergy issues, that might be tougher, but you would have better luck I believe in sit-down restaurants in the parks than quick service places finding people who speak English. Now in the hotels, you can often find English speaking people and it is easier to navigate. Next Next post: Marvel Mondays: Doctor Strange is Strange (But Awesome)!